I have collected antique pistols for over forty years and my interest has spread to all old weapons and military history. Since retiring from my career in Civil Engineering I have concentrated in writing about these subjects. 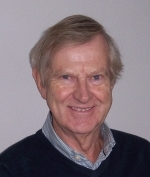 I have written many articles for Journals and Magazines in the UK, USA and Macau. More recently I have been writing articles for CityLife magazine under the banner of History Matters, and I am researching a book on Shamian Island, Guangzhou. I have also written three non-fiction books. The first Irish Gunmakers, is primarily a listing of gunmakers and gunsmiths working in Ireland from the earliest times up to the middle of the nineteenth century. My next book was The Defences of Macau. 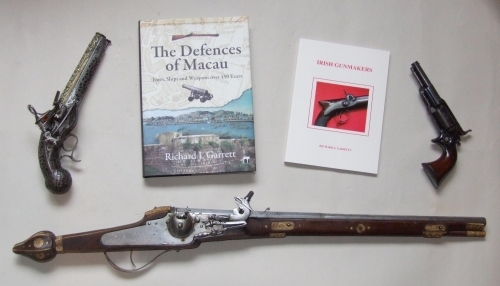 Forts, Ships and Weapons over 450 Years, published by Hong Kong University Press in conjunction with the Instituto Cultural do Governo da R.A.E. de Macau. My latest book is The Peak. An illustrated history of Hong Kong’s top district published by Blacksmith Books. For more details see Books.